The island of Spinalonga (official name: Kalidon) is located at the eastern section of Crete, in Lasithi prefecture, near the town of Elounda. 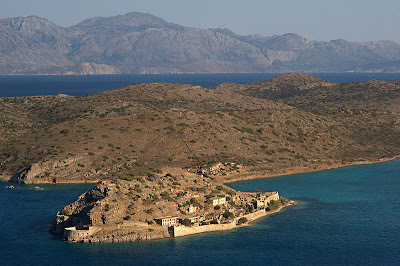 The name of the island, Spinalonga, is Venetian, meaning "long thorn", and has roots in the period of Venetian occupation. From 1903 to 1957 it is notable for being one of the last active leper colonies in Europe. The last inhabitant, an Orthodox priest, left the island in 1962. This was to maintain the religious tradition of the Greek Orthodox Church, in which a buried person has to be commemorated 40 days, 6 months, 1, 3 and 5 years after their death. Other leper colonies that have survived Spinalonga include Tichilesti in Eastern Romania, Fontilles in Spain and Talsi in Latvia. As of 2002, few lazarettos remain in Europe. There were two entrances to Spinalonga, one being the lepers' entrance, a tunnel known as Dante's Gate. This was so named because the patients did not know what was going to happen to them once they arrived. However, once on the island they received food, water, medical attention and social security payments. Previously, such amenities had been unavailable to Crete's leprosy patients, as they mostly lived in the area's caves, away from civilization. The book "Spinalonga,the isle of the Damned" by Victor Zorbas - a local expert on the island - is in editing and will be published in a new, more expand version. It relates the true story of the leper colony and compares other leper colonies in the world with the island. Because the author met with the last governor of the colony,it also contains many exclusive photos and stories of the German occupation. The book "The Island" by Victoria Hislop is set in Spinalonga and shares the fictional story of a family's ties to the leper colony. Read more about Spinalonga here.